That's a photoshop based on the Mk7. I'd take it with a bucket of salt. In any case, they nearly always look better in the metal than in photos. I second Guzzles comment. Plus its pure concept at this stage. It will go through many tweaks and revisions until its launch and the pic on the link looks like Auto Bild created the image themselves. Nothing to worry about just yet. Would VW give Auto Bild exclusive rights to publish a pre-launch YouTube video of the mk8 Golf this far in advance of the official launch? ........Not in a month of Sundays. Another Auto Express type speculative rendering. 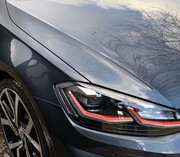 It’ll be VW that issue the first official pictures or launch video of the mk8, although there might be a few spy shots in the motoring press beforehand, as it’s not unknown for vehicles to not wear much camouflage in the final stages of road testing. Predictions, both in terms of looks and power output, are always woefully inaccurate. Apparently the gti will get 300bhp if you believe the motoring press. Hilarious. (Must make sure I delete this if it actually happens). Not going to happen. There’s only so much power you can push through the front wheels, clever slip diff or not. And it won’t be AWD, because that’s what the R is for. Leon Cupra does it but never driven one so don’t know how well it does. I reckon the new gti will be about 260 bhp. With the PP diff you could easily get 300hp through the front wheels. Praise indeed. The Cupra has the diff too, so that explains it. I’d forgotten about that.